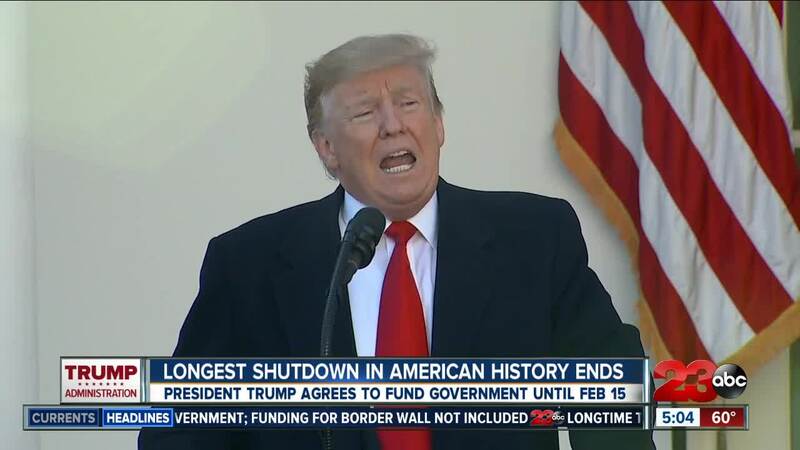 Friday, President Trump announced a deal to temporarily end the shutdown. Local Kern County leaders are weighing in on a deal reached Friday to re-open the Federal Government. House Minority Leader and Kern County Representative Kevin McCarthy issuing a statement saying border security is still a priority. Congressional Democrats have said ‘no’ to commonsense border security that would protect the American people. That is why President Trump took decisive action today to put people above politics by agreeing to reopen portions of the federal government -- including paying TSA screeners, air traffic controllers, and Federal border and law enforcement officers – and secure commitments to have Democrats start negotiating in good faith. Now it is time for the Speaker and the Senate Democratic Leader – both who have pledged repeatedly they support border security – to come to the table and negotiate with the President and congressional Republicans to do what the American people expect – secure our border. I look forward to working with my colleagues in the House and Senate to find meaningful solutions to border security, including a barrier, that the President will support. In addition to McCarthy, 1st term Congressman T.J. Cox says today's deal is a step in the right direction allowing workers to be paid for their work. I’m glad that the hundreds of thousands of workers who were forced to work without pay will now receive their compensation. But like these families, I am frustrated and angry that this shutdown happened at all. The President has agreed to the same deal that was on the table more than a month ago, but in the meantime, families across the U.S. and right here in the Central Valley have been forced to make painful decisions on rationing their healthcare, paying their rent and mortgages, and putting food on their tables. “The effects of which will be felt for years to come. “I am hopeful that in three weeks, the President and the Senate will not choose once again to close the government and inflict more damages on our federal workers. If that happens, I will again ask that my paycheck be withheld until that shutdown is resolved. In the meantime, I will continue to push for the passage of my bill, the Immediate Financial Relief Act, which would help federal workers access the cash they need in future shutdowns.